You might think that, with two such similar names, the wines made from Pinot Blanc and Pinot Gris would be broadly similar, but you would be being misled — or at the very least you would be missing out. While both of these grapes can be found elsewhere in the world, it is widely recognised that they are both to be experienced at their finest when they are from Alsace. No-one else achieves the character and the expression of these grapes as clearly as in Alsace, and food lovers should definitely explore their potential as they are two styles of wines that will allow you to make the most of many food and social occasions. Pinot Blanc generally produces lighter, creamier, easy-drinking wines that drink fabulously on a terrace in “Goldilocks weather” — neither too hot, nor too cool, but just pleasant so you don’t need anything too crisp, or warming, but rather fresh and relaxing. The Pinot Blanc variety has fresh and delicate taste which includes yellow apple, white peach and melon fruit, but can also show a light almond nuttiness. It is light bodied and light coloured, and works as a pleasant afternoon tipple, or with cold starters or lighter, creamier dishes. You will also find Pinot Blanc used to make Alsace sparkling, or Crémant d’Alsace, but in this case it brings to the fore a fresh acidity and a delicate floral character. occasionally the winery will choose to label them Klevner or Clevner which is a local alternative name for this variety. this is the only grape that can be mentioned on the label, but still contain a percentage of another grape, specifically Auxerrois. Go ‘Blanc’ when the occasion is casual and needs something quaffable - a great party wine. Pinot Gris can come in many forms, so look for the cues on the label. Wines simply marked “Pinot Gris” and from recent vintages, will be a darker, slightly golden colour, and might be dry or off-dry, with a spiced nectarine and mango fruit roundness that yearns for food flavours to work with. As the wines you find are older, or from one of the “Grand Cru” vineyards, you will find the wines will be more likely to be off-dry and have developed a smoky, musky note with more wax and intense exotic fruit, almost honeyed or with dried fruit, but still fresh on the finish. These are a great match for richer dishes or spicier foods. Finally, if you find one marked Vendange Tardive (VT), or Selection de Grains Nobles (SGN) you will find one of life’s truly unique wine experiences. Pinot Gris manages to keep its freshness while the exotic fruit salad of flavours develops even further with honeyed orange and peach as well as dried tropical fruit, wild floral and musk which can also be a wonderful after-dinner experience on its own. Go ‘Gris’ when the moment requires something a little more exotic or weighty. 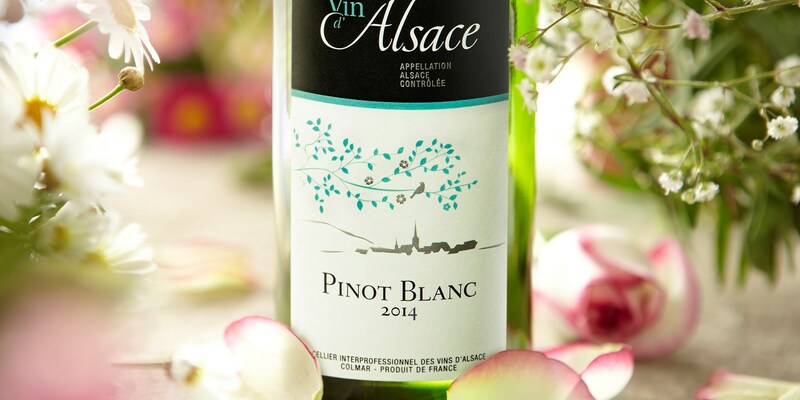 Pinot Blanc is commonly planted throughout the vineyards of Alsace, yet it is generally considered better suited to a simple, everyday wine that is best drunk young, and it is not considered a ‘noble’ grape. That role is left to the Pinot Gris, the closer descendant of Pinot Noir that still retains a darker grey and purple colour in the grape skins, hence its name. This grape loves chalky soils that give it the character and structure that allow it to develop its flavours over many years in bottle. It is also entitled to take the “Alsace Grand Cru” appellation and is worth seeking out from vineyards including Grand cru Kitterlé and Grand cru Brand. As with most grape varieties from Alsace, the wines are very food friendly and are very good at adapting to a range of cuisine, and even standing up to quite strong flavours. 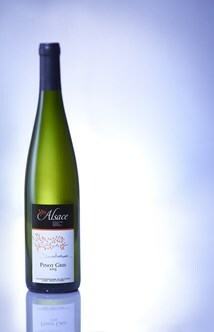 For Alsace Pinot Blanc it is worth keeping the foods lighter, creamier and possibly even slightly salty. 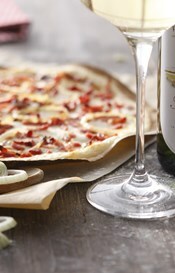 It is a great wine to drink with the Alsace speciality ‘tarte flambée’ or Flammekueche - a local dish similar to a pizza base with creme fraiche, onions and lardons. It also works very well with creamy seafood pasta, risotto dishes as well as flavoursome summer salads. For Alsace Pinot Gris you can really push the boundaries. 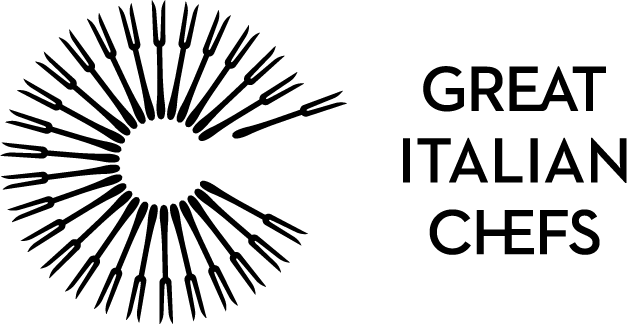 In the first instance, try it with earthy dishes involving mushrooms or herbs, such as mushroom risotto or truffle risotto with the Grands Crus wines. It is a fantastic foil for rich, fatty meats, where the sweetness adds flavour but the acidity freshens the palate. However, it is versatile enough also to be selected when you might otherwise think of choosing a red wine - with duck or other game, especially when Asian spices are involved. A local speciality might be roast partridge with a sauerkraut flambé, with sweetness from some added grapes. This grape variety also works extremely well with chicken or lamb tagines, combined with apricots. I think Alsatian wines deserve a place on any wine list, they cover a multitude of styles from mouth wateringly dry with a core of fresh acidity to lusciously sweet with aroma and characteristics to match. Aroma and terroir are the key words when dealing with Alsace; brilliant acidity, luxurious texture all help them to stand up to alongside a multitude of different dishes, with no oak ageing to take away from the pure varietal fruit that is on display these are some of the best examples of their kind. Delicious with food or on their own. Both of these grapes have so much more to offer, when they get the chance, than they are given credit for. Think of these grapes as the sisters in the Disney movie Frozen. The delicate, yet determined, Pinot Blanc would be Princess Elsa with her ice-powers. She is the ruler, and her influence is felt across the land, but she is constricted by her duties and her abilities - keeping herself largely to herself, but … when the time comes … she can ‘let it go’ and is able to add a sparkle to any situation and bring the party to life. On the other hand, Pinot Gris is Anna, the lively, naive but passionate younger sister determined to enjoy everything to the maximum, living the adventures, making new friends wherever she goes, and making good things happen. If someone is going to leave home to explore new lands, it is Anna. She’s genuine, unique and fun.